Well, we’re getting hitched up and ready to roll tomorrow. We are really pleased with “Running Bear” and all of our changes. The upgraded couch looks great, and all the changes Ron and his crew have made were just what we needed. All or you have been great to work with and we highly recommend you to anyone. Thanks so much for caring and personal touches you bring your clients. We had thought that Tom & Becky selected Americana because of our quality and the fact that we were nice folks to deal with. But Becky collects Teddy Bears! Once upon a time (too many years ago) we helped out dealers at RV shows. We found that potential buyers would see so much at RV shows that they had a hard time recalling just what they had seen and where it was located, but we found that if we could attract shoppers back to our show display, sales would increase. So, as an attraction, we would have door prize drawings, several times a day. One year we got one heck of a deal on Teddy Bears at Fedco (no longer in business) in Los Angeles. As a door prize drawing, the Teddy Bears were a huge hit. 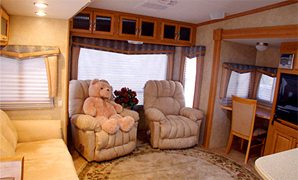 In fact we sold more fifthwheels than ever at the shows where we offered drawings for Teddy Bears! RV show shoppers would get real crusty the longer they shopped and soon they didn’t want to talk to any more salesmen. However, they still wanted good accurate information. Once the Teddy Bear was spotted, calmly sitting on the couch, the shoppers expression would change with a smile. Suddenly questions were asked and answered and orders were placed. We’ll never forget when Pat walked into one of our show display models, tears started running down her face. Now we thought we really did something wrong. Not so! She told us that she had a Teddy Bear “just like that one” when she was a little girl. 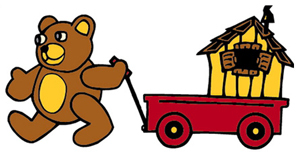 Teddy bears have become a strong part of Americana. 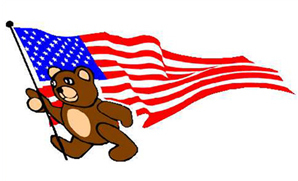 After 9/11, It didn’t take long for Teddy, the Americana Bear (being extremely patriotic), to decide to proudly join the American Flag on the front of every Americana fifthwheel. A big Teddy Bear lives in every Americana. Teddy can be played with by grand kids, nieces & nephews but cannot be given away or sold. Teddy may be needed for other kids or adults, just down the road. We all need a big Teddy Bear smile on our faces from time to time. And we all need a big Bear Hug from time to time. 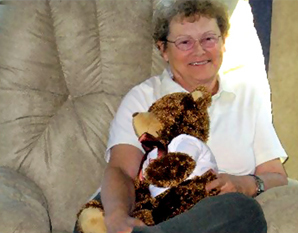 Pat Clark from Florida, sitting with Teddy in Americana’s most comfy wall hugger recliner. 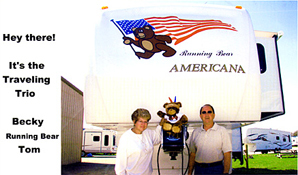 Pat and Ken placed their factory order about a year before they leased their home and checked out their new Americana model in Elkhart, Indiana, near the factory. Being new full timers, they immediately set out for Maine and other points Northeast. Lesle Thomas, Bill Borger (from Florida) holding his Teddy look-a-like, Russ Anderson (senior Americana checkout person in John Deere suspenders), Joe & Reyna Hueth from Montana. The couples sold their homes and became first time full timers in their new Americana models and both couples where checked out the same day at our upfitting center near the factory, in Indiana. Teddy is really having a great time and invites everyone to join his fun! 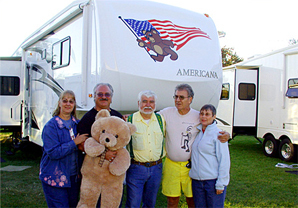 Misc info: The official greeting by members of the Escapee RV club to each other is a big “Bear Hug”. That must be why so many of our customers have become Escapees.